Description: This figure and card are in such good shape, the extra sticker is still in the top left corner. No dog ears, no nothing, nearly perfect. Last edited by mirrorman; Aug 31, '11 at 10:15 PM. Vintage 1973 Mego Spiderman Bend n Flex Bendy Nice!! Here's the 2nd of four vintage Mego Bend n Flex figures that I have had stored away for the past 30 years. This one is Spiderman. He is in unplayed condition, meaning that I never bent or twisted the figure's arms, legs, or torso. His condition is very, very good -- see front and back pix. Color is still very vibrant and fresh. No damage to the figure, just a stray little spot here and there. Thanks a lot! 1979 Spider-Man MEGO Factory Sealed! 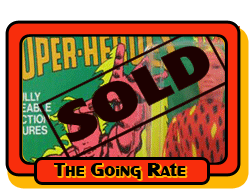 You are bidding on a factory sealed VINTAGE Spider-Man MEGO Figure from the 1979 Les Extrodinaries Super-Heroes! Figure is in flawless shape, however the cardboard backing is pretty rough shape, colors are faded, cardboard is warped slightly. This item is good for starting your action figure collection! Not in the best of shape, but still complete with original packaging! vintage mego spiderman doll. open but not used. side of package open but not ripped . like new but open so i cant list as new . the package is dated 1975 . great for a collection !!!!!! 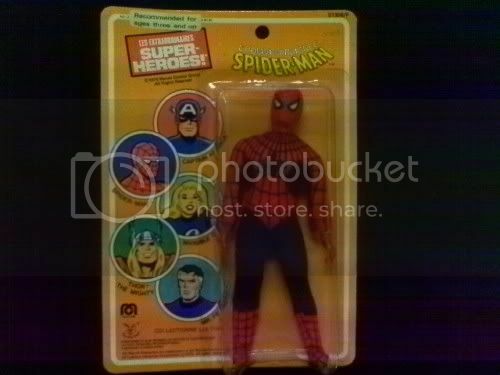 this is a vintage original mego Spiderman 8 inch figure from the world's greatest super hero line. costume is clean with no holes, tears, or runs. snaps are firmly intact. please check out pics. buyer pays 5.95 shipping. paypal accepted. please email with any questions as all sales are final. Description: Up for your purchasing pleasure we have a rare vintage Spiderman by MEGO. This Spiderman is a rare piece from the 1979 MEGO world’s greatest super heroes. The item is in excellent condition and comes on the 1979 card. The toy comes from a personal collection that was kept in a very clean, pet, and smoke free environment. 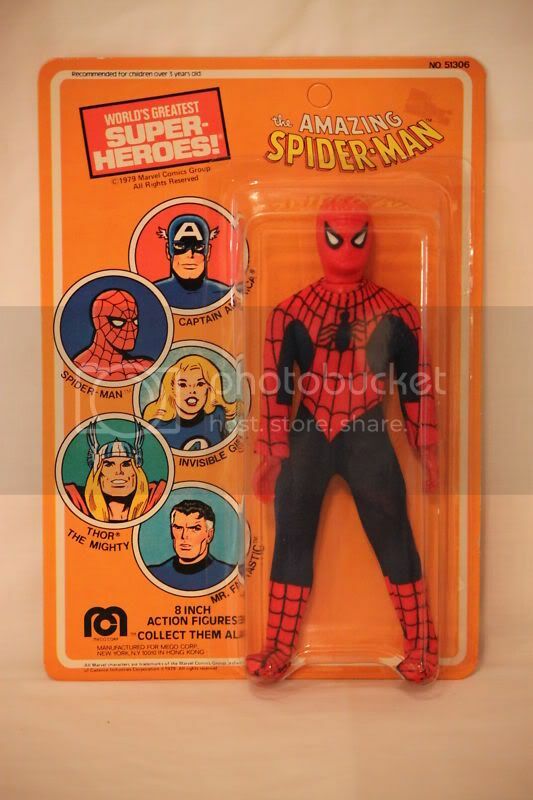 This Spiderman MEGO Doll comes un-punched and is in great condition, the front of the card is in extremely good condition without any notable defects. The bubble is in very good condition and does not seem to exhibit any defects either. The back of the card is in great condition and does not show any notable signs of wear. These pictures are taken of the actual item, to demonstrate its exact condition. Other than the mentioned very minor flaws this collector’s item is in truly great condition. You are bidding on a unpunched carded 12" Spiderman figure. The card is in wonderful shape, a C8+ at the least. No bubble lift noted. Colors are vibrant and not fadeed. See picture for details, sold as is.